Legendary music acts are revving up for LaconiaFest - the East Coast's only premier motorcycle music festival! Just a few weeks after the announcement of music legend Steven Tyler's upcoming headlining performance on June 15 (tickets for this date are on sale now), rock music icon Sebastian Bach has joined the party - headlining Sunday, June 12! Celebrated rocker Sebastian Bach is recognized globally as a vocalist, television star, actor and beyond! Bach hit the spotlight in the late 1980's as the iconic frontman for mainstream heavy metal act SKID ROW. Since his departure from SKID ROW in the mid 90's, Sebastian Bach still remains one of the most relevant rock figures in pop culture today, with network television appearances on MTV, VH1 and CMT, guest appearances on Gilmore Girls, Trailer Park Boys, Californication and other popular television shows, and several acting stints on and off Broadway. 2014 marked the release of Bach's most recent album, Give 'Em Hell, which impressively - proving his prowess decades after his initial debut - landed on the U.S. Top Hard Rock and Top 200 Billboard charts. Bach's upcoming Harper Collins memoir 18 And Life On Skid Row is set to be released later this year. "We're so pleased to have Sebastian Bach joining us for the inaugural LaconiaFest," states Tyler Glover, managing member and co-producer of LaconiaFest. "We're dedicated to bringing our attendees the greatest musical experience, so we're really looking forward to his amazing performance!" 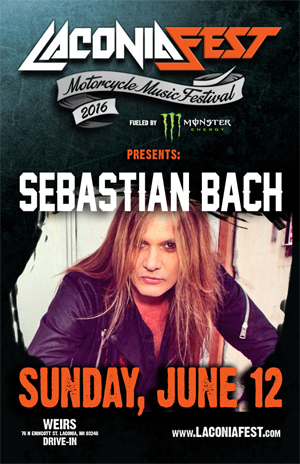 Tickets for the Sunday, June 12 Sebastian Bach headliner date are on sale now, just $30 for the entire day of entertainment, via www.LaconiaFest.com and www.TicketGalaxy.com. LaconiaFest will be held in conjunction with the world-famous 93rd annual Laconia Motorcycle Week in Laconia, New Hampshire and will appropriately include all day food and drink, motocross stunt shows, motorcycle model/product stagings and more.This high-octane, nine-day festival (June 11-19, 2016) will take place in the heart of Downtown Weirs Beach at the Weirs Beach Drive-In Theatre. LaconiaFest is sponsored by Ticket Galaxy, Stoli Vodka and Monster Energy. Sebastian Bach joins fellow LaconiaFest headliners Steven Tyler, Bret Michaels, Ted Nugent, Buckcherry, Sevendust and Fuel with additional performances from rock music's top talent of today and yesterday including Warrant, Lita Ford, Trixter, LA Guns, P.O.D., Attika7, Dope, Saving Abel, Biters, Adelitas Way, Bullethead, and Milow The Girl. In total, the festival will feature over 100 internationally and regionally recognized artists. LaconiaFest will feature two stages and festival attendees will rock out to live music for 12 hours a day - noon to midnight. Stay updated on the emerging line-up of artists and their performance dates and times via www.LaconiaFest.com. LaconiaFest is about to cement itself as a world-class, week-long music experience destination! The grounds at the Weirs Beach Drive-In Theatre will be transformed into a festival atmosphere, set to feature several entertaining daily attractions included in the cost of a festival ticket. First and foremost, LaconiaFest will include FMX (freestyle motocross) stunt shows featuring performances from outstanding athletes Keith Sayers, James Carter and Todd Potter. Attendees will enjoy a festival village, delicious foods, bars, biker builders, vendors and a paint ball game zone, with attractions being added daily.